I’ve spent some time the last couple weeks studying Brexit and its potential market ramifications and here’s what I’ve come up. I started doing the analysis on the assumption that there’d probably be a chance to buy British stocks on the cheap as Brexit was supposedly about to happen. But after reading just about everything I could get my hands on about Brexit — including speeches, policies and minutes from the Bank of England (the UK’s Central Bank a la the US Federal Reserve), it soon became clear to me that I needed to “Flip It” and go to the other side of the trade. Brexit probably isn’t happening. Even the Bank of England is in on the game as they’ve been pushing propaganda warning that the British GDP would collapse 5% after Brexit and would collapse over 8% if its a “hard Brexit.” The politicians themselves are playing a game o f plausible deniability as they keep Prime Minister May in place while continually voting down her not-quite-Brexit bills. The corporate powers and global banks that control UK’s government don’t want Brexit to happen (never did want it to) and are executing a pretty obvious playbook here to try to get what they want. The markets expect that Brexit isn’t happening with the UK stock market, the FTSE, up 7% year-to-date and in a steady up trend which is where this trade idea gets interesting. 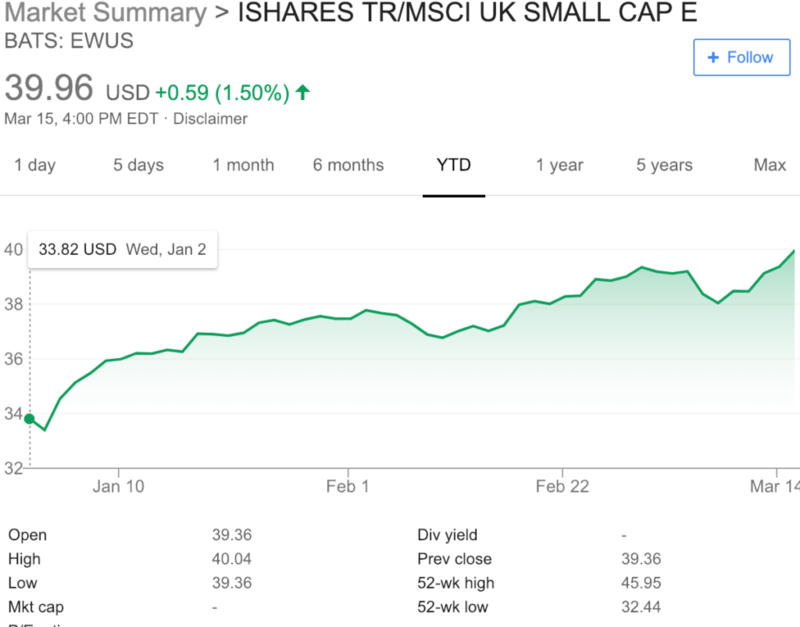 The UK small cap stock market, as represented by the EWUS ETF is up a whopping 18.3%! Just because Brexit isn’t likely happening doesn’t mean it’s all clear sailing for the markets for here. Indeed, I wouldn’t be shocked to see some sell-the-news reactions because even if Brexit doesn’t happen, the EU gets to play a bit of hardball now when theUK comes back to negotiate a new non-Brexit deadline. Perhaps “hardball” in this case means utilizing the headline risk opportunity they have to make the British markets freak out and get some concessions they wanted or something. What happens if the UK votes Theresa May’s Brexit through? If the markets don’t want Brexit, then there’d likely be at least a short-term sell-off of maybe 2-3%. What happens if there’s actually a “hard” Brexit? Well, the markets would likely freak out and whoosh down, at least short-term, 5% or more. So here’s the playbook. I’m going to close out my QQQ and SMH short hedges and replace them with a short position in EWU, a US-based ETF that’s all UK-based stocks. I’ve also bought a few EWU puts dated out in April and July with strike prices right around the current price of EWU. I’m also shorting some EWUS (no puts available on EWUS). I’m just getting started in these shorts but I do want to have some short hedge exposure on the sheets and I think there’s a much better thesis. There’s certainly risk that the UK stock markets continue to rally along with the rest of the global stock markets, but I think there’s a better asymmetric risk/reward to this short hedge than merely shorting the Nasdaq and US semiconductor index. I’m putting my British shorts on.